Agricultural innovation systems (AIS) is a global perspective accidently invented by ICRISAT nearly 20 years ago. At that time ICRISAT along with the rest of the CGIAR was struggling with the question of how to improve the impact of its research. Partnership with the private sector as a way of achieving impact was a highly controversial idea. The failure of impact assessment research to make a difference and help set priorities could only be discussed in hushed whispers. AIS thinking explained why partnership was critical for innovation. It explained why we needed to shift from measuring impact to learning how to achieve it. And it explained why (institutional) innovations in the innovation process were a critical part of an organization’s, a sector’s and a country’s capacity to innovate. Unsurprisingly it took many years before these ideas started to become main streamed and uncontroversial, but in the process many misunderstanding and confusion have crept in. it can help frame a missing learning and research enquiry on how innovation and impact at scale really happens. Like all promises, there is work to do to keep that promise. So why not do it at ICRISAT where it all started? re initiative to achieve the Sustainable Development Goals, supported by Microsoft, aWhere, USA and T-Hub. Digital technology can accelerate the pace of developing and delivering sustainable and equitable solutions to smallholder farmers and in so doing enable us to achieve the Sustainable Development Goals before 2030. This includes narrowing the knowledge gap between researchers and farmers; providing timely and targeted information to farmers to manage weather and market variability and integrating farmers into profitable markets. Over 100 data analysts, hardware buffs and software developers came together with agriculture domain experts at a two-day hackathon, titled Hack4Farming, to explore digital solutions to address agricultural development issues in India. 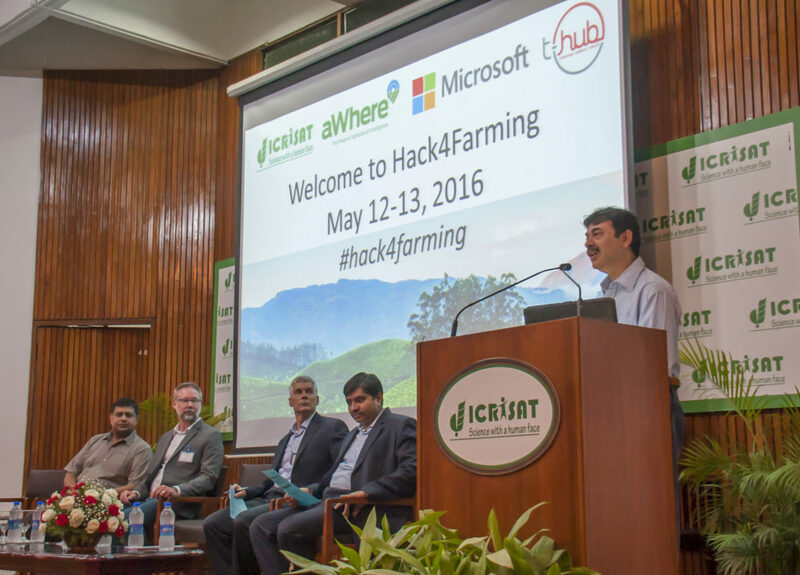 Hack4Farming focused on weather and systems modeling, and their potential impacts on the Indian agriculture sector. Teams explored how to leverage new modeling techniques (from ICRISAT), weather data (from aWhere, USA) and Intelligent Cloud (from Microsoft) to address the information gaps, and benefit the agriculture stakeholders including seed producers, service providers and farmers across India.